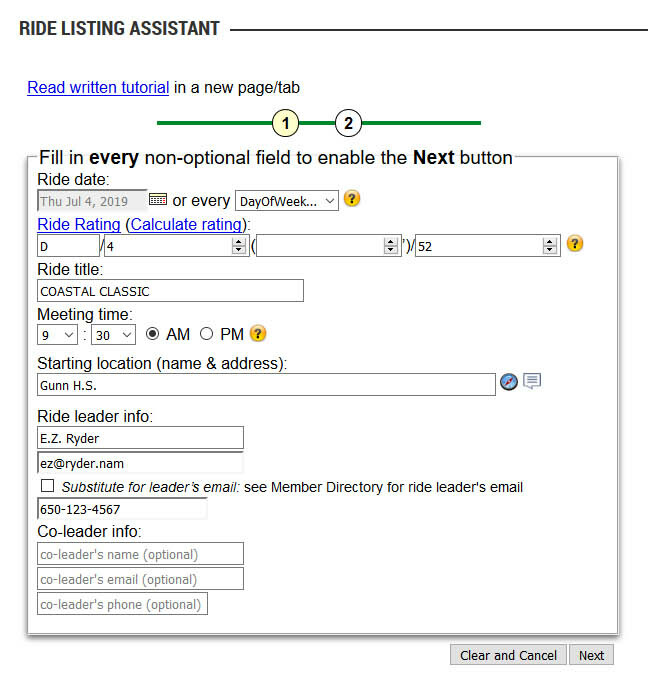 The Ride Listing Assistant can help you submit rides in a standard format with all the important details included so that your ride can be successfully posted as expeditiously as possible. 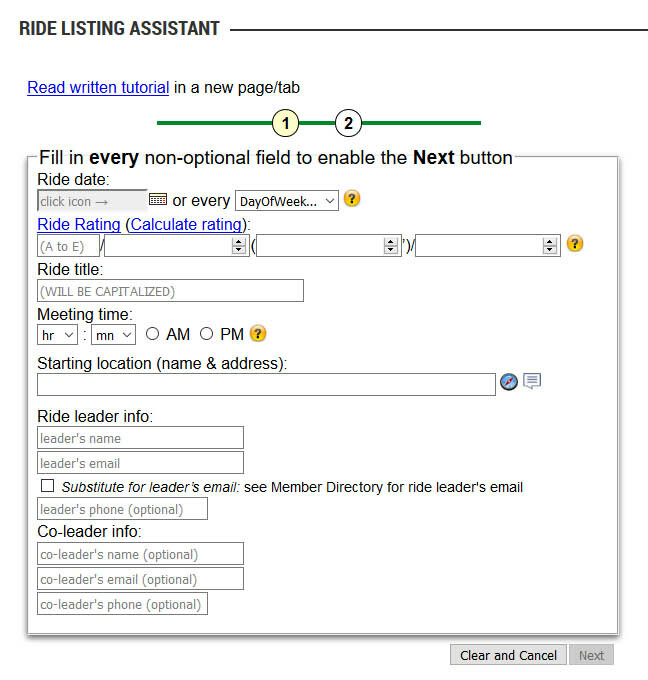 To use it, go to the WWBC home page at westernwheelers.org, login, hover over the Ride Leaders' Resources link on the top right-hand side of the page, and click on Ride Listing Assistant in the dropdown menu. Tab to, or click in, each box and fill in the appropriate information. or the day of the week for repeating rides. 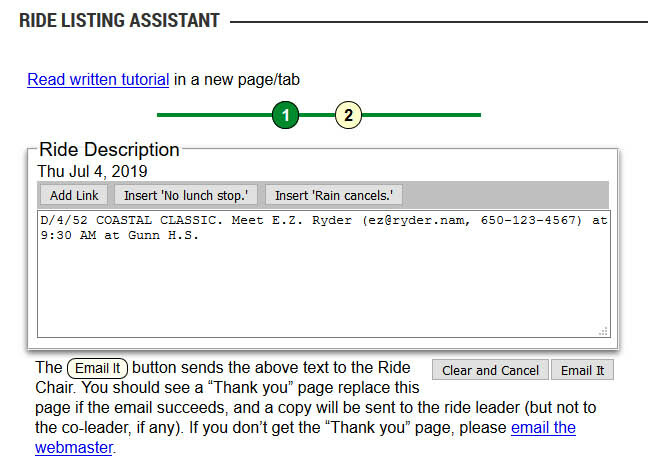 The leader's email is required, but you can check the box underneath it to omit the email from the generated ride description and have it refer people to the WWBC member directory instead. The Next button will remain grayed out and inoperable until all the required fields are populated. Type the description of your ride here, following the rating and ride title. If you change your mind about submitting the ride, or want to start over, you can click the Clear and Cancel button at any time prior to submission. When you are satisfied with your ride description, click the Email It button. The Ride Listing Assistant will email your ride description to the Ride Chair's team at addride@westernwheelers.org and to you, and it will return a "Thank you". If you do not see the "Thank you" confirmation, your ride was not submitted. Please contact webmaster@westernwheelers.org to submit the ride for you. That’s it! 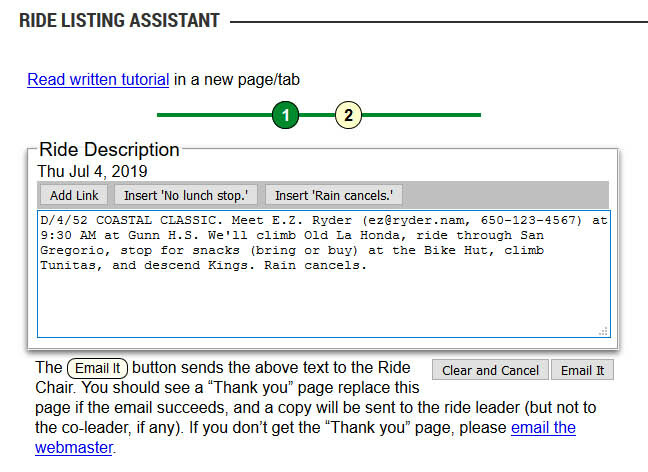 Thanks to Michael Khaw, our web consultant extraordinaire, for developing the Ride Listing Assistant. Supported Browsers: Internet Explorer 8 or newer, Firefox 3.5 or newer, Safari 3 or newer, Chrome 4 or newer. Older versions of IE have known issues.